Background: Prostaglandins (PGs) have short existence in vivo because they are rapidly metabolized by NAD+-dependent 15-hydroxyprostaglandin dehydrogenase (15-PGDH) to 15-ketoprostaglandins. Inhibition of 15-PGDH causes elevated level of PGE2 in cellular system. It will be valuable for the therapeutic management of diseases requiring elevated PGE2 levels, like wound healing. Objective: Ninety-eight plant samples were screened for the discovery of potent 15-PGDH inhibitor. Among them, top five plant extracts as potent 15-PGDH inhibitor were chosen to determine PGE2 release from HaCaT (Keratinocyte cell line) cell line. Finally, top 15-PGDH inhibitor was selected to evaluate in vitro wound healing effect on HaCaT scratch model. Method: The inhibitory activity for 15-PGDH inhibitors was evaluated using fluorescence spectrophotometer by measuring the formation of NADH at 468 nm following excitation at 340 nm. Cell viability assay and PGE2 release was evaluated in HaCaT cell line after treatment of 15-PGDH inhibitors. Scratches were made using sterile 200 μL on HaCaT cell and wound-healing effect was evaluated after treatment of 15-PGDH inhibitor. Results: 15-PGDH inhibitors elevated PGE2 levels in concentration-dependent manner. Ethanol extract of Artocarpus heterophyllus (EEAH), the most potent 15-PGDH inhibitor (IC50 = 0.62 µg/mL) with least cytotoxicity (IC50 = 670 µg/ml), elevated both intracellular and extracellular PGE2 levels. EEAH facilitated in-vitro wound healing in a HaCaT (Keratinocyte cell line) scratch model. Conclusion: EEAH might apply to treat dermal wounds by elevating PGE2 levels via COX-1 induction and 15-PGDH inhibition. Biological inactivation of 15-PGDH causes elevated level of PGE2 which will be useful for the management of disease that requires elevated level of PGE2. Prostaglandins (PGs) are lipid compounds that participate in a variety of physiologic and pathologic processes, and among them, PGE2 is a major mediator for inflammation. PGE2 is formed by PG synthetase from PGH2 through the cyclooxygenase (COX) pathway. Two types of COX have been identified: (i) COX-1 has been expressed constitutively in various tissues, including stomach, and (ii) COX-2 has been induced by cytokines, growth factors, tumor promoters, and other agents. Newly synthesized PGE2 simply diffused and actively extruded by the multidrug resistance 4 (MRP4) from the cells. Subsequently, EPR receptor is activated followed by pericellular PGE2 is cleared via re-uptake of PGE2 by PG transporter (PGT) and then rapidly metabolized by cytosolic enzyme named NAD+-dependent 15-hydroxyprostaglandin dehydrogenase (15-PGDH). This enzyme is expressed ubiquitously in mammalian tissues and responsible for biologic inactivation of PGE2 to 15-ketoprostaglandins. PGE2 has been known as an important mediator for bone formation,, gastric ulcer healing,, and dermal wound healing., Additionally, PGE2 has been used to treat gastric ulcer in spite of high price and low efficacy., Therefore, PGE2 elevation using 15-PGDH inhibitor would be valuable for the management disease that required elevated PGE2, like wound healing. Wound healing is a complicated process in human or animal in which skin or another organ-tissue repair itself after having wound. In normal skin, epidermis and dermis maintain steady-state equilibrium to maintain protective barrier against the external environment. Once the protective barrier is broken, the wound-healing process immediately set in motion and complex biochemical events takes place to repair the damage. The aim of this study was to screen most potent 15-PGDH inhibitor from plant source and evaluate its wound-healing efficacy using in-vitro scratch model in HaCaT cell. Plant extracts were purchased from the Korean Plant Extract Bank (Daejeon, Korea). PGE2, NAD+, NADH, glutathione-sepharose 4B, dithiothreitol (DTT), sodium dodecylsulfate (SDS), EDTA, reduced dlutathione, mitomycin, and other chemicals and reagents were purchased from Sigma (St. Louis, MO, USA). TGF-β1 was purchased from BioVision (California, USA) and pGEX-2T expression vector from Pharmacia Crop. (New Jersey, USA). cDNA of human 15-PGDH was cloned from human placenta as illustrate earlier. PGE2 enzyme immunoassay kits were obtained from Thermo Scientific (Rockford, IL, USA). UV-Vis spectrophotometer (Shimadzu, Japan) was used to obtain UV spectra. Real-time PCR was performed using a Light Cycler 2.0 (Roche, Mannheim, Germany). Scratches were visualized and pictures captured using a transmission electron microscope (Hitachi, Tokyo, Japan). Different parts of plants were dried in the dark for 7 days and then grounded to powder. The powder samples were extracted three times with ethanol and extracts were obtained through removal of solvents during evaporations. The concentrated samples were stored at -20°C. One hundred milligram of crude extracts were dissolved in 1 ml of commercial grade ethanol. pGEX-2T expression vector was used to transform 15-PGDH cDNA plasmid into E. coli BL-21 lysS. The cells were grown in LB Broth (1.0 L) containing 50 mg/L ampicillin at 37°C and 230 × g. Isopropyl-1-thio-β-d-galactopyranoside was added to 1 mM when OD600 reached 0.8 and cells were allowed to grow for additional 12 h at 25°C. Cells were harvested by centrifugation at 4000g for 20 min at 4°C and pellets were resuspended in 20 mL of cold cell lysis buffer (1× PBS buffer pH 7.4 containing 1 mM EDTA and 0.1 mM DTT) and sonicated (3 × 15 s at 4°C) to disrupt cells. Sonicated pallets were centrifuged at 4000g for 20 min at 4°C and supernatant obtained was applied to a glutathione-sepharose 4B column. The column was rinsed with lysis buffer until OD280 reach less than 0.002. 15-PGDH was eluted from column using elution buffer (50 mM Tris-HCl pH 8.0 containing 10 mM reduced glutathione, 1 mM EDTA, and 0.1 mM DTT). The purity of 15-PGDH was examined by sodium dodecyl sulfate polyacrylamide gel electrophoresis (SDS-PAGE) and concentration measured. The inhibitory activity was evaluated using fluorescence spectrophotometer, measuring formation of NADH at 468 nm following excitation at 340 nm. Reaction mixture was prepared in 2 mL of Tris-HCl buffer (50 mM, pH 7.5) containing 0.1 mM DTT, 0.25 mM NAD+, purified enzyme (10 µg), 21 µM PGE2 and various concentration inhibitors. 15-PGDH inhibitory activities were evaluated using standard curve of NADH. Each concentration of inhibitor was assayed in triplicate. HaCaT cell line (Keratinocyte cells) was cultured in Dulbecco's modified Eagle's media (DMEM) supplemented with 10% heat inactivated fetal bovine serum (Sigma) and 100 µg/mL penicillin. Cells were cultured in a 5% CO2 atmosphere at 37°C. Cell viabilities were evaluated using MTT assay. HaCaT cells (1 × 104/90 μL of DMEM medium) were seeded in 96-well plates. After overnight incubation, plant extract samples were treated for 72 h and after that 10 µL of MTT (5 mg/mL stock solution) was added into each well, incubated for 4 h at 5% CO2 atmosphere at 37°C. Medium was then removed and 150 μL of DMSO was added to dissolve Formazan crystals. Absorbance was measured at 540 nm using ELISA microplate reader (Perkin-Elmer, California, USA). Extracellular PGE2 releases were determined in HaCaT cell line using various concentrations of five most potent plant extracts as a 15-PGDH inhibitor. HaCaT cells were seeded (5 × 105 cells/well) into six-well culture plates in DMEM, supplemented with fetal bovine serum and antibiotics for overnight under 5% CO2, 37°C. Various concentrations of plant extract were added into individual well and media collected after 6 h for extracellular determination and cells were harvested for intracellular determination of PGE2. Concentrations of PGE2 were determined using PGE2 enzyme immunoassay kit (Cayman, MI, USA). Total cellular RNA was isolated from HaCaT cells according to TRI reagent-specific instruction (RNA iso Plus, Takara Bio. Inc., Shiga, Japan). cDNA was synthesized using reagent-specific instruction of Superscript First Strand synthesis system for reverse transcription-PCR (Invitrogen, Carlsbad, CA, USA) from isolated RNAs. Primers used for real-time PCR were as follows: COX-1 forward, 5'-CCTCAT GTTTGCCTTCTTTGC-3' and reverse, 5'-GGC GGGTACATTTCTCCATC-3' COX-2 forward, 5'-GATCTA CCCTCCTCAA-3' and reverse, 5'-GAACAACTGC TCATCAC-3' MRP4 forward, 5'-AACCTCTAACCGACATTCCTG-3' and reverse, 5'-TCAACATA TTACAGCCACCATC-3' human PGT forward, 5'-GGATGCTGTTTGGAGGAATCCTCA-3' and reverse, 5'-GCACGATCCTGTC TTTGCTGAA-3' and β-actin forward, 5'-GACTATGACTTAGTTGCGTTA-3' and reverse, 5'-GTTGAACTCTCTACATAC TTCCG-3'. PCR reaction mixture contained 4 µL of diluted cDNA (1:5), 10 pmole of each forward and reverse primer, 4 mM MgCl2, and 4 µL of Fast Starter Mix buffer (dNTPs, SYBR Green dye and Tag polymerase). In-vitro scratch assay was performed in HaCaT cell line to examine wound-healing effect as previously reported, using EEAH. HaCaT cells were seeded into six-well plates (5 × 105 cells per well) and grown until reached to 80% confluence. After that media was replaced with serum-free DMEM containing mitomycin (10µg/mL) and cells were incubated for 2 h to prevent wound proliferation. Plates were extensively washed with PBS and then scratches were made using sterile 200 μL pipette tip, and cells were re-washed. 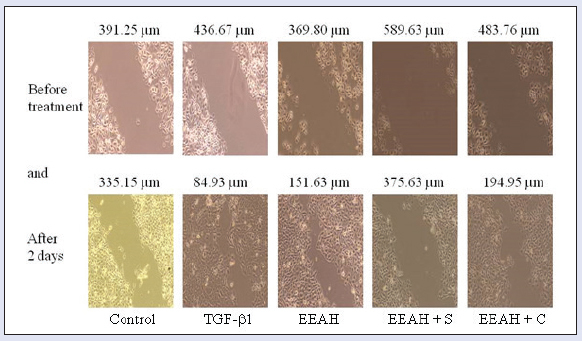 TGF-β1 (100 pg/mL) as a positive control or EEAH were added to the medium. Pictures were taken in the same position before and after incubation to document the wound-healing process. Scratch experiments were repeated thrice and representative pictures are included in this study. Scratches were photographed under microscope (×100) immediately after scratching and also after 48 h of incubation at 37°C in 5% CO2 incubator. Each experiment was performed at least three times and data are expressed as mean ± SE. Statistical significance was determined using paired Student's t-test and P value less than 0.05 were considered statistically significant. 15-PGDH inhibitory activities (IC50 µg/mL) are illustrated in Supplementary Table S1 [Additional file 1]. Glochidione hirsulta was the most potent inhibitor for 15-PGDH having 0.36 µg/mL IC50. Five most potent inhibitors were assayed for cytotoxicity. Relative cytotoxicity was determined in vitro by anchorage-dependent cells, HaCaT. Result showed that EEAH was more toxic (cytotoxic IC50 70 µg/mL) among tested inhibitor. Further, it is necessary to check whether 15-PGDH inhibitors could increase PGE2 in cellular or not. Most potent inhibitors were treated for 12 h with concentration of 10 and 100 times of IC50 of 15-PGDH inhibition and percentage increment in PGE2 were measured using ELISA kit. They increased PGE2 in a concentration-dependent manner and EEAH increased PGE2 level significantly [Table 1]. Results confirmed that tested inhibitors increased PGE2 level in vitro cellular system. Further investigation was concentrated on EEAH. PGE2 level in cellular system might depend on the expression level of COX-1/2, MRP4, and PGT. COX-1/2 is responsible for the production of PGE2 from PGH2 and MRP4 and PGT plays important role in the transportation of PGE2. Relatively low concentration of extracellular PGE2 compared with intracellular PGE2 was observed after the treatment with EEAH, suggesting that above-mentioned factors would determine PGE2 regulation in biologic systems [Table 2]. HaCaT cells were treated with EEAH and regulation of COX-1/2, MRP4, and PGT was evaluated using real-time PCR. Real-time PCR assay showed that EEAH increased expression level of COX-1/2, MRP4, and PGT [Figure 1]. 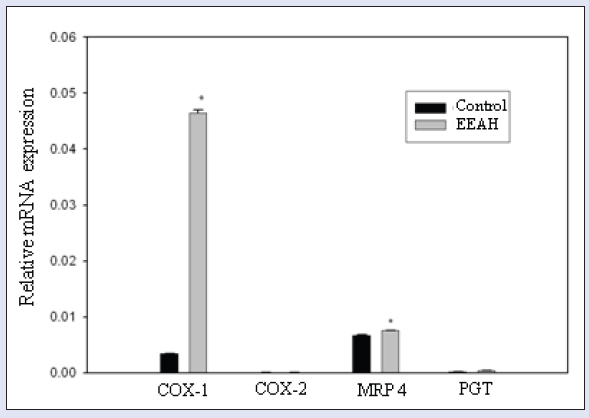 Observed data showed that high intracellular PGE2 concentration in HaCaT cells may be due to the activation of COX-1 and 15-PGDH inhibition by EEAH. In-vitro wound healing study was performed using HaCaT scratch model. Various experiment sets were designed to evaluate the results: no drug treatment as a negative control, TGF-β1 (100 pg/mL) as a positive control, EEAH (6.2 µg/mL) only and in combination with COX-1/2 inhibitor (SC 560 0.5µM and Celecoxib 0.5µM), respectively. The photographs were taken before treatment and after 2 days incubation at 37°C, 5% CO2. EEAH facilitated wound healing (recovery distance: 60%) as compared with the negative control (recovery distance: 15%). Wound-healing effect of EEAH was comparable with TGF-β1 (recovery distance 81%). Similarly, COX-1 inhibitor (SC560) prevented the would-healing effect of EEAH partially (recovery distance: 37%); however, COX-2 inhibitor (Celecoxib, recovery distance 40%) did not interfere with wound-healing effect of EEAH. These results suggested that COX pathway as supplier of PGE2 plays important role in wound healing [Figure 2]. During wound healing, we have also monitored elevation level of PGE2 on time interval and higher PGE2 concentration was observed during 12–24 h and slightly reduced at 48 hr [Table 3]. Plant as a source of medicine used for traditional healthcare system for several thousands of years. New drug development scientists have been focusing their studies on medicinal plants in different parts of the world., There are significant economic benefits in the development of new medicines from plants for the treatment of variousdiseases. Twenty-five percent of medicines belong to plants source and their derivatives. Plants as a source of traditional medicine are used to cure diseases involving skin problems, cold, fever, cough, headache, diarrhea, fertility problems, and toothache. Therefore, 15-PGDH inhibitor was investigated in this study because of diverse therapeutic values and ample of opportunity to develop new drug from plant source. 15-PGDH negatively regulates PGE2 levels and activity in vivo., In this study, extracellular and intracellular PGE2 levels were elevated in HaCaT cell line after treatment of 15-PGDH inhibitors [Table 1] and [Table 2]. The levels of PGE2 available to cells are dependent on function of COX-1/2, MRP4, and PGT in PGE2 signaling. EEAH elevate COX-1 mRNA expression significantly, while MRP mRNA expression slightly, which helps to increase availability of PGE2 levels in HaCaT cell line [Figure 1]. Recently, Kochel and Fulton reported that MRP4, PGT, and 15-PGDH play important role in regulating PGE2 levels. Previously, several scientists have reported wound-healing efficacy of plant extracts.,,, This study investigated the role of PGE2 during the wound-healing process that was induced by plant extract. Tissue regeneration plays important role during recovery from injury, including wound healing, and PGE2 is candidate molecule that helps in regeneration of tissue. After scratching, extracellular medium was collected on different time interval (0, 12, 24, and 48 h) and PGE2 concentration was measured. When wound being, the activity of PGE2 was increased because there was increase on extracellular PGE2 concentration during 12 and 24 h in all the tested samples because of inflammatory and proliferative actions on wound bed. COX-2 expression and PGE2 production in the wound bed increase as dermal wound healing transitions from scarless to a scarring phenotype. At a cellular level, PGE2 was shown to regulate the proliferation of fibroblasts from both wound-healing phenotypes. Hemostasis, inflammatory, proliferative, and remodeling are the major steps of wound healing, where PGE2 plays an important role. EEAH plays important role to elevate PGE2 level in cellular system by inhibiting 15-PGDH that accelerates wound healing. 15-PGDH inhibitor alone will give better result of wound healing than COX inhibitors because of elevated level of PGE2. Therefore, inhibition of 15-PGDH with plant extracts will be valuable for the therapeutic management of diseases requiring elevated PGE2 levels like in wound healing. The clinical efficacy and safety of these plant extracts as well as the purification of active ingredients from these plants remains to be done. Plant samples and 15-PGDH plasmid were kindly gifted by Cheol-Hee Choi, Chosun University, Gwangju, Republic of Korea. Griffiths R. Prostaglandins and inflammation. In: Inflammation: basic principles and clinical correlates. Philadelphia, PA: Lippincott Williams and Wilkins 1999;349-60. Schuster VL. Prostaglandin transport Prostaglandins Other Lipid Mediat. 2002;68:633-47. Schuster VL. Molecular mechanisms of prostaglandin transport. Annu Rev Physiol 1998;60:221-42. Anggard E, Samuelsson B. Smooth muscle stimulating lipids in sheep iris. The identification of prostaglandin F 2a. Prostaglandins and related Factors 21. Biochem Pharmacol 1964;13:281-3. Anggard E. The biological activities of three metabolites of prostaglandin E 1. Acta Physiol Scand 1966;66:509-10. Li M, Thompson DD, Paralkar VM. Prostaglandin E(2) receptors in bone formation. Int Orthop 2007;31:767-72. Keller J, Klamer A, Bak B, Suder P. Effect of local prostaglandin E2 on fracture callus in rabbits. Acta Orthop Scand 1993;64:59-63. Hatazawa R, Tanaka A, Tanigami M, Amagase K, Kato S, Ashida Y, et al. Cyclooxygenase-2/prostaglandin E2 accelerates the healing of gastric ulcers via EP4 receptors. Am J Physiol Gastrointest Liver Physiol 2007;293:G788-97. Shigeta J, Takahashi S, Okabe S. Role of cyclooxygenase-2 in the healing of gastric ulcers in rats. J Pharmacol Exp Ther 1998;286:1383-90. Parekh A, Sandulache VC, Singh T, Cetin S, Sacks MS, Dohar JE, et al. Prostaglandin E2 differentially regulates contraction and structural reorganization of anchored collagen gels by human adult and fetal dermal fibroblasts. Wound Repair Regen 2009;17:88-98. Wilgus TA, Bergdall VK, Tober KL, Hill KJ, Mitra S, Flavahan NA, et al. The impact of cyclooxygenase-2 mediated inflammation on scarless fetal wound healing. Am J Pathol 2004;165:753-61. Fung WP, Karim SM. Effect of 15 (R) 15 methyl prostaglandin E2 on the healing of gastric ulcers: a double-blind endoscopic study. Med J Aust 1976;2:127-8. Gibinski K, Rybicka J, Mikos E, Nowak A. Double-blind clinical trial on gastroduodenal ulcer healing with prostaglandin E2 analogues. Gut 1977;18:636-9. Nguyen DT, Orgill DP, Murphy GF. The pathophysiologic basis for wound healing and cutaneous regeneration. 2009;In: Biomaterials for treating skin loss Chapter 4 Cambridge/Boca Raton: Woodhead Publishing (UK/Europe) and CRC Press (US). Stadelmann WK, Digenis AG, Tobin GR. Physiology and healing dynamics of chronic cutaneous wounds. Am J Surg 1998;176:26S-38S. Ensor CM, Yang JY, Okita RT, Tai HH. Cloning and sequence analysis of the cDNA for human placental NAD(+)-dependent 15-hydroxyprostaglandin dehydrogenase. J Biol Chem 1990;265:14888-91. Hintermann E, Bilban M, Sharabi A, Quaranta V. Inhibitory role of alpha 6 beta 4-associated erbB-2 and phosphoinositide 3-kinase in keratinocyte haptotactic migration dependent on alpha 3 beta 1 integrin. J Cell Biol 2001;153:465-78. Koivisto L, Jiang G, Hakkinen L, Chan B, Larjava H. HaCaT keratinocyte migration is dependent on epidermal growth factor receptor signaling and glycogen synthase kinase-3alpha. Exp Cell Res 2006;312:2791-805. Abu-Rabia A. Urinary diseases and ethnobotany among pastoral nomads in the Middle East. J Ethnobiol Ethnomed 2005;1:4. Hanazaki N, Tamashiro JY, Leitao-Filho H, Gegossi A. Diversity of plant uses in two Caicaras communities from the Atlantic forest coast, Brazil. Biodivers Conserv 2000;9:597-615. Azaizeh H, Fulder S, Khalil K, Said O. Ethnobotanical knowledge of local Arab practitioners in the Middle Eastern region. Fitoterapia 2003;74:98-108. Principe P, Riley PA, Slater TF. Cellular thiols in rat liver cell lines possessing different growth characteristics. Cell Biochem Funct 1991;9:125-33. Tai HH, Ensor CM, Tong M, Zhou H, Yan F. Prostaglandin catabolizing enzymes Prostaglandins Other Lipid Mediat. 2002;68-69:483-93. Myung SJ, Rerko RM, Yan M, Platzer P, Guda K, Dotson A, et al. 15-Hydroxyprostaglandin dehydrogenase is an in vivo suppressor of colon tumorigenesis. Proc Natl Acad Sci USA 2006;103:12098-102. Kochel TJ, Fulton AM. Multiple drug resistance-associated protein 4 (MRP4), prostaglandin transporter (PGT), and 15-hydroxyprostaglandin dehydrogenase (15-PGDH) as determinants of PGE2 levels in cancer. Prostaglandins Other Lipid Mediat 2015;116-117:99-103. Shailajan S, Gurjar D. Wound healing activity of Chrysophyllum cainito L leaves: evaluation in rats using excision wound model. J Young Pharm 2016;8:96-103. Shailajan S, Gurjar D. Wound healing efficacy of Mimusops elengi L flowers in albino Wistar rats using excision wound model. Pharmacogn Commn 2016;6:72-9. Hasamnis AA, Mohanty BK, Murali krishna, Patil S. Evaluation of wound healing effect of topical phenytoin on excisional wound in albino rats. J Young Pharm 2010;2:59-6. Gutierrez RMP, Soils RV. Anti-inflammatory and wound healing potential of Prosthechea michuacana in rats. Pharmacog Mag 2009;5:219-25. Zhang Y, Desai A, Yang SY, Bae KB, Antczak MI, Fink SP, et al. Tissue regeneration. Inhibition of the prostaglandin-degrading enzyme 15-PGDH potentiates tissue regeneration. Science 2015;348:aaa2340. Quinn JV. Tissue adhesives in wound care. 1998;Hamilton, ONB.C Decker, Inc.